Millville, NJ October 2, 2010. After several days of torrential rain and high winds, the skys over New Jersey Motorsports Park have finally cleared. 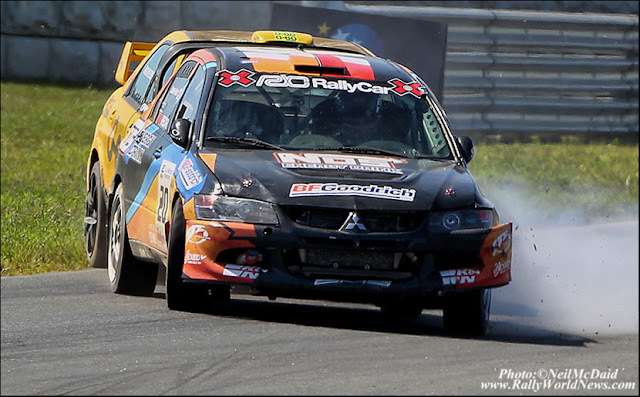 Round 2 of the 2010 RallyCar/Rally Cross Championship is set to get underway today. Many familiar faces from round 1 are back on the line with the addition of a few very exciting new entries. Most notable being Liam Doran from England who will take to the course at NJMP in his Citroen C4. This will be the first time for USA Rally and RallyCross fans to see this car on U.S. shores. Doran captured third overall in the hotly contested 2010 European Championship. You can be assured that he will be in contension for the overall victory this weekend. [Doran]"Citroën is not in the U.S. marketplace so the car there is going to be a huge novelty value around driving a Citroën in America. They’ve never seen a C4 out there. I did not see any point in going out there for one race and being one of perhaps three or four Europeans, that’s why I’ve bitten the bullet and gone my own way," said Doran who will have full backup from the Citroën-backed KHM squad in America. "We are taking Kenneth Nyberg and Rickard Johansson [the two lead engineers from KHM] as well as all the parts and support that we need, it will be as close to the way I’ve run in Europe as possible." Millen’s back!! Hyundai and Rhys Millen Racing will be piloting a Hyundai rally car specifically developed for the World Rally Championship. "We've really benefited from our Genesis Coupe Formula Drift partnership with Rhys, and so we've decided to expand on that with this move into RallyCross," said John Krafcik, president and CEO, Hyundai Motor America. "Our participation this year is all about learning the ropes of this new series. Next year, we'll campaign with an all-new car that's also going to be an exciting entry to Hyundai's U.S. production lineup." "I'm excited to be stepping back into the world of rally," said Rhys Millen, professional race driver and founder of Rhys Millen Racing. "It has been six years since I was involved with the inaugural X Games rally event and now with RallyCross here in the U.S., what better way to prove the performance and power of the Hyundai brand." Stay tuned throughout the weekend for updates and images.